Little Bay Pet Services LLC – Why Are So Many Millennials Opting For Pets Instead of Parenthood? Why Are So Many Millennials Opting For Pets Instead of Parenthood? When they say there’s two types of people in this world, cat-people and dog-people, I fall staunchly in support of the pooch. It seems, cat and dog people also tend to self-segregate because in the last year since I finally adopted my own four-legged fur baby I’ve had five close friends pick my brain about the cost of being a dog mom. Lucky for them, it’s not a guess. I know, down to the penny, how much my 8-year-old Jack Russell Terrier mix has cost me. Considering how millennials tend to be delaying traditional life milestones like marriage, home-buying and baby making, it’s no surprise that millennials are adopting more pets: 35% as compared with 32% of Boomers, according to research firm GfK. Fifty-seven percent of millennial households own a dog versus 51% of all U.S. households. And we have our reasons for treating our pets like surrogate children. Dogs are not cheap. Type “average cost of raising a dog” into Google and you’ll get hits with American Kennel Club stats like $2,674 for the first year of raising a small dog, with its giant breed counterpart averaging $3,536. The ASPCA significantly drops the cost down to $1,580 for a medium-sized dog. Both of these estimates are, however, significantly less than I’ve spent on my admittedly spoiled dog, Mosby. Even though Mosby is a senior rescue, the start-up price just to bring him home cost $400 (much higher than going through ASPCA), then an additional $200 to purchase his New York City dog license, register his microchip and buy some basic supplies. Thirteen months later I’ve spent just over $5,000 on Mosby’s happiness and well-being. He is fed expensive dog food that costs about $35 a month and I’ve purchased some silly products we’ve never really used – like a paw plunger to clean his feet after walking around on slushy New York City sidewalks. But the big reasons for that hefty number were an unexpected surgery and his many trips to the dog sitter when I’m traveling (or paying for him to fly with me). Even with Mosby being a real budget-buster, which I’m always sure to disclose to friends interested in becoming a dog parent, he is still a lot cheaper than a baby. A 2013 report from the USDA averaged the annual cost of raising a child for a two-parent, middle-income family to be $12,800 to $14,970 depending on the age of the child. If you live in the urban Northeast, make that $282,480 to raise a child to 18 — not to mention the healthcare costs attached to pregnancy and delivery as well as the unpaid maternity/paternity leave many parents face. Dogs need heaps of love and attention, but not constant monitoring like a human child. It isn’t considered an abusive (or illegal) practice to leave your pup at home alone while you head off to work. Parents don’t have the luxury to do this with a child. Kids need to be watched all the time and the price tag of childcare runs from about $720 per month to $2,230 depending on the type of care a parent selects. Not to mention needing a babysitter for date nights, ladies’ nights out, or just because you wanted to go do something spur of the moment. A dog affords the self-indulgent option to “just go out,” assuming the pup has been cared for first and, yes, there is a clock on getting home before he defecates in the house, but it doesn’t have to cost extra. Then again, those who hire a dog walker for seven days a week or drop off the fur baby at a doggie day care may indeed end up shelling out about the same as the low-end cost of childcare. First comes love, then comes getting a dog together. Raising a dog can help committed couples who are either married or heading towards a future with a baby learn some parenting 101. At the very least, it gives you some insights into how your partner may be as a parent. My long-term partner and I don’t co-habitat, but we do co-raise Mosby. Peach (my boyfriend) often takes Mosby when I’m out of town and always walks and feds him when I’m working late. We learned to adjust our schedules around making sure Mosby didn’t get left alone for too long at any given time. It’s been interesting for us to see how the other reacts in tense situations, like Mosby getting hurt, now that a living creature depends on us. Those who adopt a puppy deal with the sleep deprivation in those early weeks when you’re being kept up late with whining and howling during crate training, wake up every few hours to let the dog out to ensure it becomes house broken and deal with the mess of cleaning up accidents or finding expensive shoes have been chewed. Of course, dogs and babies aren’t the same. Many a mother has bristled at those who dare to compare fur babies to humans. However, for those in a phase of life where the thought of nurturing a child seems too stressful or financially cumbersome – a dog is a perfect companion. 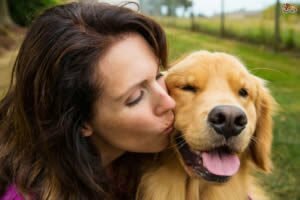 A dog provides unconditional love, can be great for your mental and physical health, and helps you learn more about your partner if you’re headed towards those often procrastinated millennial life stages of marriage and baby making.